She is blonde, pretty, has the look and the charm of a slightly perverse girl. Her name is Kim Wilde and she is the daughter of Marty, a Sixties rock star. A hit single, Kids in America, revealed her to the European public and the TV show Happy circus (network one) revealed her to the Italian audience. 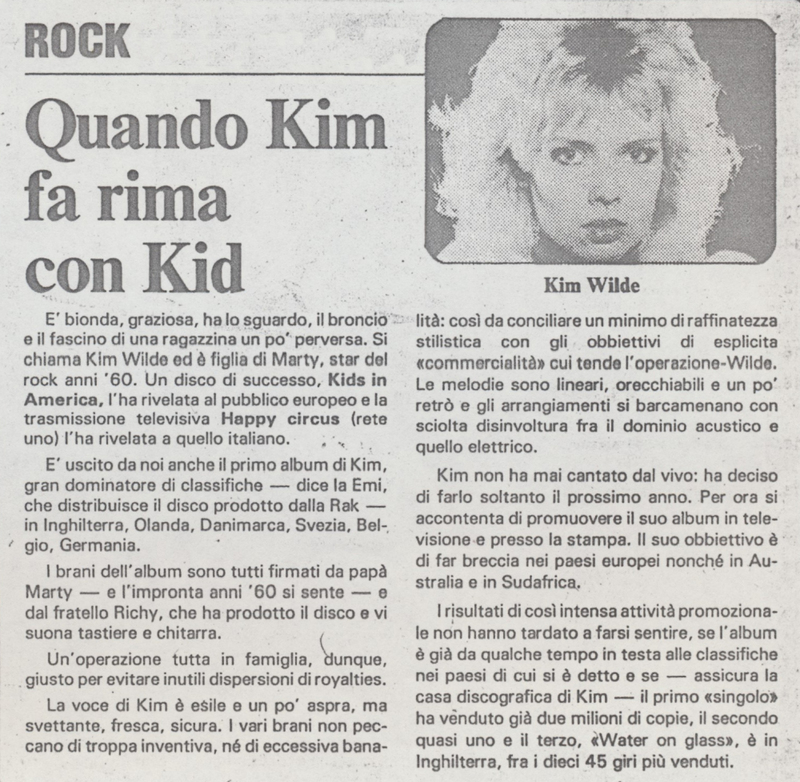 Kim's first album was released by us, a great ruler of the charts - says Emi, who distributes the Rak-produced record - in England, Holland, Denmark, Sweden, Belgium, Germany. The songs on the album are all signed by dad Marty - and the Sixties imprint is felt - and by her brother Ricky, who produced the record and plays keyboards and guitar. An operation that is all in the family, therefore, just to avoid useless dispersion of royalties. Kim's voice is thin and a bit harsh, but soaring, fresh, confident. The various pieces are not too inventive or overly trivial: so as to reconcile a minimum of stylistic refinement with the objectives of explicit "commerciality" to which the Operation-Wilde aims. The melodies are linear, catchy and a little retro, and the arrangements end up with a smooth ease between the acoustic and the electric domain. Kim never sang live: she decided to do it only next year. For now he is content to promote his album on television and in the press. Its goal is to break into European countries as well as Australia and South Africa. The results of such intense promotional activity have not been slow to be felt, if the album has already been at the top of the charts for some time in the countries mentioned above and if - assures Kim's record company - the "single" promo has already sold two million copies, the second almost one and the third, "Water on glass", is in England, among the ten most popular singles.